(I’m In With) The Inn Crowd! I picked this issue up at a recent dollar-sale at a nearby shop…it caught my attention for the title itself and the cover, putting me in mind of recent posts over at The Crapbox of Son Of Cthulhu for Magical March. And with some recent discussions with others, I was in the mood for something I’d never heard of before specifically (at least in conscious recollection) and decided of the issues of this present, #10 looked the most interesting. 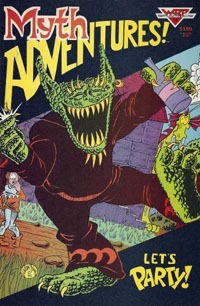 The cover shows a goblin-like creature apparently rather happy and ready to party (the caption says Let’s Party!). I "assumed" that the issue was black and white given it looks like something from the 1980s. It turned out I was correct–1986 and indeed black and white. As I had assumed that, it certainly met expectation and is not at all a negative factor! We open with a "party" walking into an inn, where the proprietor(s) don’t quite know what to make of them. It quickly becomes apparent that they’re basically rich snobs looking for an "exxxxxxclusive" hangout, and they’re willing to pay top dollar for it. This leads to some ‘discussion’ between the goblin Aahz (who can assume human form) and his apprentice, Skeeve–over money and some things being more important than money. We then see the two trying to entertain their guests and the various mis–or rather myth–adventures they get into, including a pet(?) dragon Gleep trying to join in some skinny-dipping fun in the lake. Eventually, even Aahz has had enough of the group and decides to convince them to leave by lowering prices and welcoming conventions–though this gets results far faster than expected, startling all involved as a convention heads their way (to be continued!). I like that we get names for all the guests quickly on (Goldie, Hunk, Kitten, Zap, Stella, and Rock). Aahz I figured out pretty quick, and while he refers to his apprentice mostly as "Kid," I was able to figure out he’s Skeeve, and found acceptable-to-me-confirmation of that in the letters page. This is a TENTH issue, after all–not a first issue, not some special issue or jumping-on-point, not a giant-size issue, etc…so while it COULD have done with a DC or Marvel "cliche" of headshots/names or such at the start of the issue, I didn’t really expect much of that, or to get to know much about main characters for just one issue. That I was able to pick up on stuff as I did is a very definite positive to me! The art is quite good in and of itself…I can’t quite think if it’s that this is a black and white book or what, but I did notice the lack of backgrounds in a lot of panels. Lacking the much larger visual diversity that color can bring, though…too much detail without quite the right style would merely muddy the appearance. So while I NOTICED the lack of backgrounds…as one reading much more for the story than anything else, that was not a problem to me; and there ARE plenty of panels that DO have backgrounds, so it probably balances out where I just don’t notice as much in color comics because a background could be conveyed by solid color where it’s whitespace on a non color comic. Reading this issue by itself, I enjoyed it as a one-off. I got the sense of there being some details I was missing (how Skeeve and Aahz met and more specifics of their relationship, the background of Gleep the dragon, and Duke Pinchpini (pinch-penny/penny-pincher?) to name a few). But coming in "cold" on the tenth issue, that’s nine other issues preceding this to check out and see what’s what and when and all that. Further curiosity has led me to realizing there were at least a dozen or so issues, and that these are based on a series of novels, which casts the series in a different sort of light for me. All in all, though, this was simply a fun issue, and i’m glad that I got it, and read it…and I actually regret not picking up more (there were at least three other issues I left behind). I believe there have been several collected editions; I can’t speak to their availability in print, but if I see any other single issues in bargain bins or such, I’ll definitely be picking them up…and may even be looking into at least trying the first of the novels! If you’re looking for light fantasy fun that plays with various tropes and such, and the humor that can go with (and something to this puts me in mind of Terry Pratchett‘s sort of humor), this would be a good issue, and if you find any of the other issues, I can guess that they’d be similarly fun. The way this one ended…I definitely want to get the next issue at minimum! I paid $1 for this–a bit more than most of my bargain-bin digging, but it’s worth the $1, and for not being something I’d come across before, I’d say any of the issues in this series will certainly be worth at least $1 to ME to pick up moving forward. This issue details the background and a then-new status quo with Supergirl, and Lex Luthor II, the son of the late Lex Luthor, arch-enemy of Superman. We see this young couple as they’re new to each other, Luthor curious about this Supergirl’s background, and she’s totally fallen for him, as he’s a visual doppelganger at least to the man who created her and gave her life in a pocket/alternate universe. That background–that readers saw over the course of The Supergirl Saga and subplot elements following, and things that came out in the Panic in the Sky story–is recounted here, as Supergirl tells Luthor. This also serves as further introduction for newer readers as to this Supergirl, her background, and her abilities. Meanwhile, we get touchpoints in other subplots–Jimmy Olsen had been fired but now recently re-hired to the Daily Planet. Perry had been gone, but now is back, and we see him meeting a Ron Troupe. We also see development in stuff with Cat Grant and her career, as well as Sam Foswell, who had temporarily held Perry’s job. We also see Clark and Lois spending time together as a newly-engaged couple and whatnot, as well as reporters. And then the “core” of the issue, as Luthor announces Supergirl has joined Lexcorp, and Clark is quite concerned about what she may have let slip to Luthor–about him, his parents, and so on. The Superman/Supergirl discussion gets heated, she instinctively lashes out, and this physical altercation is caught on camera by one of Luthor’s cameramen–accompanying him as he pursued the Super-duo, trying to keep tabs on his girl. 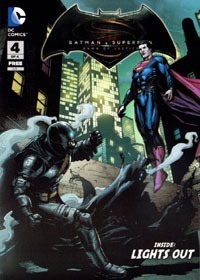 Though Luthor demands the tape from his man and promises it will never see air while he’s around, he neglects to destroy it, which keeps Superman at a certain point of unease, as we see that this bright, charming son of Luthor has a certain questionable, dark streak to him…that as the issue fades out, indicates could be quite threatening indeed. In retrospect, this is quite a “key” issue, primarily on the Supergirl and Team Luthor front. 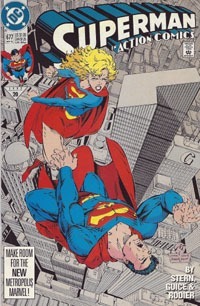 In fact, much of this issue was pretty directly adapted in the Dirk Maggs audio drama Superman Lives!, which adapted the novelization Superman: Doomsday and Beyond based on this and other comics in the Death and Return of Superman saga. I quite enjoy Stern‘s writing, and the Guice/Rodier visuals. 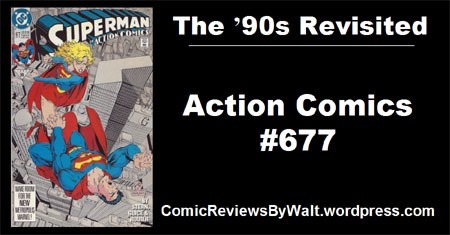 Everyone looks as I remember them from this time frame…which would be expected, given the pretty consistent nature of the creative teams on the books in 1992, into the Death of Superman stuff and beyond. I even recognized Foswell, as much by name as appearance, given a story this issue is a few months from at this point. Story-wise, this packs a LOT into a single, regular-sized issue’s page-allotment. Of course, this was in the midst of the best of the “Triangle Numbering” period, where the Superman titles all had their own focused subplots, but collectively served as a nearly-weekly ongoing singular title (with ongoing elements, but Action Comics really taking the reins on dealing with Luthor II’s background, for example, or Superman: The Man of Steel taking the reins on the underworlders, etc). I remember being aware of this issue for awhile before acquiring a copy for myself back in 1993 or ’94–whenever it was that I actually did. 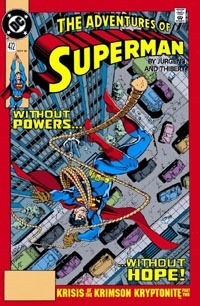 I was even more aware of what the content of the issue was, thanks to the Stern novelization The Death and Life of Superman, which included loads of continuity detail from the Man of Steel mini-series by Byrne through key issues up to and including the actual Doomsday!, Funeral for a Friend, and Reign of the Supermen run. Finding that this one issue alone had so much key stuff that factored into the larger story–the comics AND Stern‘s novel–is quite cool on this read-through. It seems so odd in 2018, snagging this for 25 cents to recall that it was not an issue simply or readily available to me as a kid–and I think I may have paid $3-5 for it as a “priced back issue,” at the time. 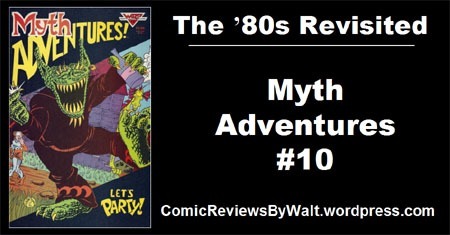 While many of the “random” single issues from this time period might be relatively inconsequential, this one, and I believe the next, are a couple of rather “crucial” issues, and are much more worthwhile to pick up as single issues than most. That said, a lot of my enjoyment here is from being quite familiar with the history and context of these characters, including knowledge of information that had not quite yet been revealed when this saw publication and would have been originally read…and knowing where things go, and hence how important this is. It’ll be much more enjoyable to one familiar with this period of the Superman comics, or going through everything from the time, than as a one-off if you’ve no familiarity with the time or the Death/Return/etc. I paid a whopping 25 cents for this particular copy…and that was well worth it to me to revisit this without digging through longboxes looking for a copy, or even having to deal with lugging a box off a storage rack just to get at it. 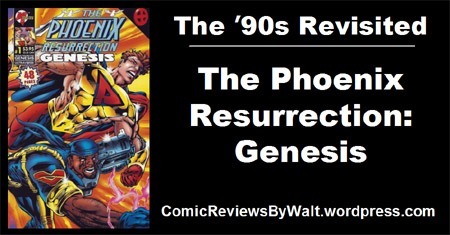 As Marvel publishes Phoenix Resurrection in the present, 22 years ago it published The Phoenix Resurrection through Malibu Comics‘ Ultraverse line. Malibu Comics, which Marvel had purchased in order to keep DC Comics from buying the smaller publisher. And with the smaller publisher in-hand…looking back through this issue at least, it seems Marvel had no idea what to do or have done with the small superhero universe it now had in addition to its own. This Genesis issue was preceded by a month-long promotion in which each of the 7 then-current Ultraverse titles had a 3-page flipbook segment showing the characters encountering some kinda reference to a phoenix, though taken as a whole that made for a disjointed mess. 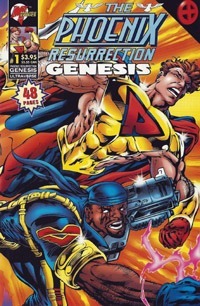 The seven chapters were reprinted/collected into a single issue in The Phoenix Resurrection: Red Shift. Getting into the main/actual story of the "event" now with this issue, we get a prologue of the Phoenix Force being discovered by some probe from another universe. 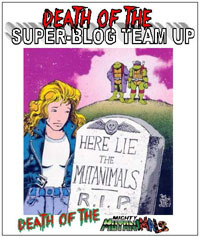 Before long, through machinations of the Gateway character, a squad of X-Men find themselves once more in a parallel universe that they’ve become increasingly familiar with (a footnote reference to the Mutants vs. Ultras special issue, itself collecting several previously-exclusive American Entertainment editions such as Prime vs. Hulk, Wolverine vs. Night Man, and All New Exiles vs. X-Men). While bystanders and news media are focused on something coming from the sun, Ultra hero Prime engages the X-Men in combat, because of course they’ve gotta fight. The source of the aforementioned probe–a mother ship that’s buried in the ocean–reunites with a counterpart in the sun, and brings the Phoenix Force to this Earth, and then tries to drain its energy–its life–causing the Phoenix entity to be driven insane with pain. The entity bonds with Prime as a host body, and continues to fight the X-Men, as other Ultras are brought to the scene. (It should be mentioned that apparently the mutants’ powers are severely dampened in this reality…but that’s a crutch that doesn’t much matter for discussion of this particular issue). Eventually, the Phoenix and Prime are separated, and the Phoenix takes a new host, as the issue ends (to be continued in Phoenix Resurrection: Revelations). Maybe it’s that I look back on the likes of Prime, Mantra, and Rune with memory of more complex, authentic-sounding stories and characters, as well as the same from the X-Men books from the early/mid-’90s (particularly stuff like Fatal Attractions or the Age of Apocalypse and immediate aftermaths) but this just does not feel like it has much depth, nor is there–even in an extra-sized issue like this–much characterization. It’s like the characters were chosen for the book by "popularity" and "mainstream-ness" (plus, of course, being characters appearing in books that survived into the pared-down 7-book line of Black September-onward), and not really for much else. We have a squad of X-Men and some major Ultraverse characters thrown together, but I get no real sense of depth, development, or motivation. The probe and mother ship have a far-too-convenient means of getting the Phoenix to Earth, Gateway seems nothing but "convenience" personified, and we’re told rather than shown that the mutants’ powers are lessened here. Prime comes off as nothing but some petulant kid–while he IS a kid, he’s lacking a depth I feel like I remember from his own original title. Bishop seems to be present for appearance’s sake, and with the mutants not even really trying to use their powers, there’s no particular point to any specific character’s presence…they’re interchangeable. With the art, I recognize Darick Robertson and Art Thibert as names if not an actual art style here; but having numerous artists on this single issue doesn’t particularly do it any favors…at least for me reading it in a fair bit of isolation here–perhaps they’re the artists on the main books, in which case I’d welcome that (in idea at least), but just jumping into this issue after the Red Shift collection of 3-page shorts, I’m not thrilled with the visuals. I recognize the various characters–there seems to be an attempt to have them all look a certain way, perhaps using a "house style" or such–but virtually nothing stands out to me. Everyone is for the most part a generic iteration of iconic appearance (for lack of better phrasing). The only real stand-out bit for me was the large image of the Phoenix-possessed Prime (though zero mention or visual reference from the Ultraverse side OR X-Men side of the Prime body being healed/repaired after an obvious significant slash from Wolverine’s claws and Jubilee’s reaction to the green goop). Ultimately, offhand, I didn’t so much "not enjoy" this as I "didn’t ENJOY" it. It’s cool–at least conceptually–to see the mix of characters thrown together and all. But after 17+ years of having "decompressed stories" that are clearly serialized graphic novels, I definitely am expecting much more depth of character and stuff from two sides like this to be brought out. This is a definite novelty, one certainly worth 25 cents or so as a bargain-bin purchase, if only for the time it takes to read making it more worthwhile than most anything of its size published in present-day. You can definitely dive into this issue withOUT reading anything before it…the "crossover" stuff from the Red Shift 3-page segments are little but token reference-points thus far, making this a better "starting point" if only for having a big chunk of a single story that’s not jumping to a new setting/character every 3 pages. You could do worse than this issue…but much as I’m down on modern Marvel, if you’re looking for "return of Phoenix" stuff, you’d be better served with the contemporary Return of Jean Grey story in the 2017/2018 Phoenix Resurrection, or in 2012’s AvX event series. I like when an issue’s title is worked into its title page…all the more after recently re-noticing the way Marvel "cheats" by having a non-story page for credits/story titles that can simply be omitted from a collected volume to ignore the fact the story was serialized first. Here, we open on a couple screens of news reports recapping recent goings-on and leaving off that authorities are trying to determine if "…Doomsday is Near!" 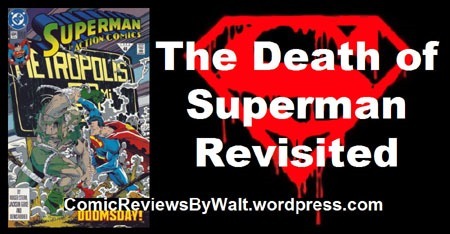 We then pick back up with Superman, Guardian, and Maxima, and Guardian is no longer worried about lecturing Superman, and Superman has him get Maxima to a hospital while he–Superman–resumes taking on the Doomsday creature. 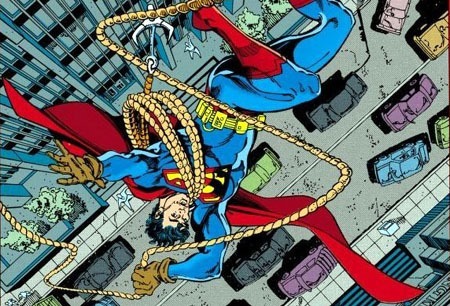 Superman catches up to Doomsday after it takes out an overpass and hurls a car–Superman saves the car and driver. Then Doomsday wrecks a Lex-Mart (think Walmart)…but is able to take in a loud commercial from a tv about a wrestling match in METROPOLIS…and the creature is taught a word, a destination. Lois and Jimmy are on-site in a helicopter reporting on things, Lex Luthor II and Supergirl watch tv reports, and Luthor convinces Supergirl to stay put, to not leave Metropolis unprotected. Trying to get Doomsday away from populated areas, Superman hurls him into the distance, forgetting about Cadmus’ "Habitat" facility (fortunately deserted). 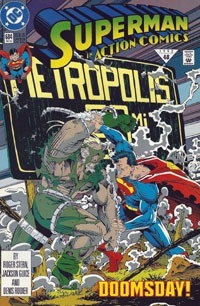 Guardian catches up while the combatants are both stunned, and then Doomsday breaks free of the wreckage (knocking out the two heroes) and bounds onward, now intentionally bound for Metropolis. This issue’s art is not bad at all…but the visual style is something different from both Jurgens and Grummett in a way I just don’t like the same way. Nothing’s particularly "off" in anyone’s anatomy; everyone is recognizable as who they are; I have no trouble following the flow of physical events and the story itself. I just prefer the former to Guice and Rodier here. That said, there are some stand-out moments to me–I do like how Supergirl looks (though she doesn’t get to "do" much here), and same for Lois. The wrestler in the commercial Doomsday sees reminds me very much of Hulk Hogan, which may have been the intention at the time (remember, this was 25 years ago that this saw print!). Story-wise, this flows pretty well from the previous chapter, picking up much like an opening of a tv show where it’s not exactly frame-for-frame picking up, but picking up within the same scene within moments of where we left off. Though most of the issue is more battle, we get the "moments" between characters–Superman and Guardian; Lois and Jimmy; Supergirl and Luthor, etc. There’s no context given on Supergirl and Luthor…their status quo and presence were very much a part of "continuity" of the time…so they were just there, to be understood by longer-time readers or simply glossed over if one wasn’t familiar with stuff. I hadn’t given it much thought, but as this issue continues the "countdown" (three panels per page, down from four), there’s more visual/unspoken action, and in a way, that leaves less room for story, and a quicker pace. We jump scene to scene essentially, but it works, as the whole battle is drawing out…we’re down to basically just Superman, as Maxima’s out and by the looks of things (and memory), Guardian’s basically out, and we already saw the rest of the Justice League taken out. This is definitely another issue that doesn’t have much going for it in terms of being stand-alone; it is definitely very much a middle chapter of a tight, full story spread across multiple titles by multiple creative teams. Of course, it’s not a bad one if you come across it in a bargain bin to snag, but much more enjoyable in context of the full story. I do feel like–next to Justice League America #69–this is the issue of the story I’ve seen least in bargain bins, though come to think of it, Superman #74 may be similar. This is the fourth of the Superman titles carrying the Doomsday! story–with the next two chapters being second issues of their titles with the story, before the Funeral for a Friend picks up.